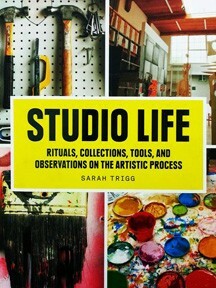 The book, entitled Studio Life: Rituals, Collection, Tools and Observations on the Artistic Process, includes pages dedicated to 100 of the 200 artists across the country that Sarah Trigg talked to. The project, which she figured would take one year, consumed three. Sarah Trigg, an artist who grew up in Appleton and has been living and working in Brooklyn, recounts how an artist friend looked around her studio as she prepared to move out of her DUMBO [Down Under the Manhattan Bridge Overpass] neighborhood and remarked that a chunk of foam sitting on a window sill was like a mascot. Trigg decided to visit studios across the country to talk with artists and photograph their stuff – mascots, collected objects, makeshift tools, rituals, residue and habitats. Portraits and images of their actual art is available elsewhere, she noted. She found the studio visits illuminating. “In a few cases I was familiar with the work but understood it much more clearly after the visit,” she writes, noting that artists rarely have other artists visiting their studios; more often they see collectors, gallery owners or curators. In 2011, partway through her residency at threewalls in Chicago, she writes, she visited her father who has a home in Sturgeon Bay, and asked him about artists in Door County. The next day, on his suggestion, she ended up in Pamela Murphy’s studio. “In tandem with her studio practice, she lives off the food grid by maintaining a vegetable garden, beehives, and a ten-acre animal farm with goats, chickens, rabbits and geese,” Trigg writes. Trigg’s photographs show Buddhist prayer flags that Murphy brought back from her studies in India and Pakistan, drawers of the vintage photographs that inspire many of her large, layered paintings, and her miniatures. The book also includes pictures of Murphy’s goats and geese and explains her decision to live outside a big city. Pamela Murphy is represented in Door County at Fine Line Designs in Ephraim. 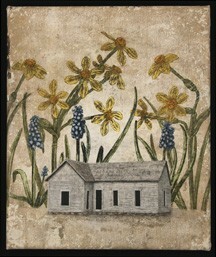 For more information about Murphy and her work, visit pamelamurphystudio.com or finelinedesignsgallery.com. Studio Life published by Princeton Architectural Press also features a peek in the studio of artists Tauba Auerbach, John Baldessari, Diana Al-Hadid, David Humphrey, Jim Shaw, Carol Bove, Tony Oursler, William Wegman, and Dana Schutz – among many others. Studio locations range from New York to Berlin, San Francisco to Buenos Aires. The book is available for purchase by visiting papress.com or amazon.com.